By Sarah Peebles. Assisted by Rob Cruickshank, electronics; John Kuisma, woodworking; Chris Bennett, pyrography. Current Location: Lake St. George Field Centre, TRCA in Richmond Hill (for use in school programmes; not open to the public). 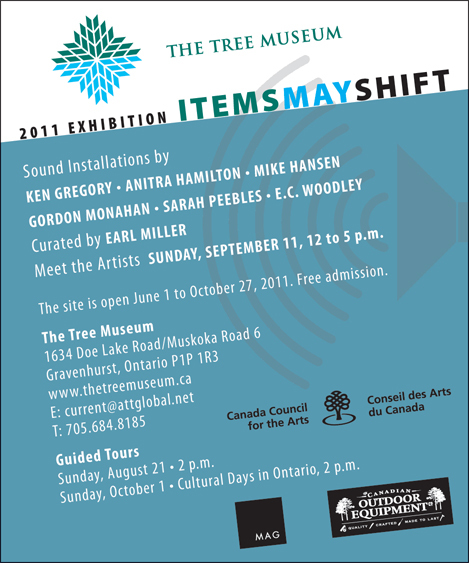 Commissioned for Items May Shift, at The Tree Museum in Gravenhurst, Ontario (Summer, 2011 only; event information below). 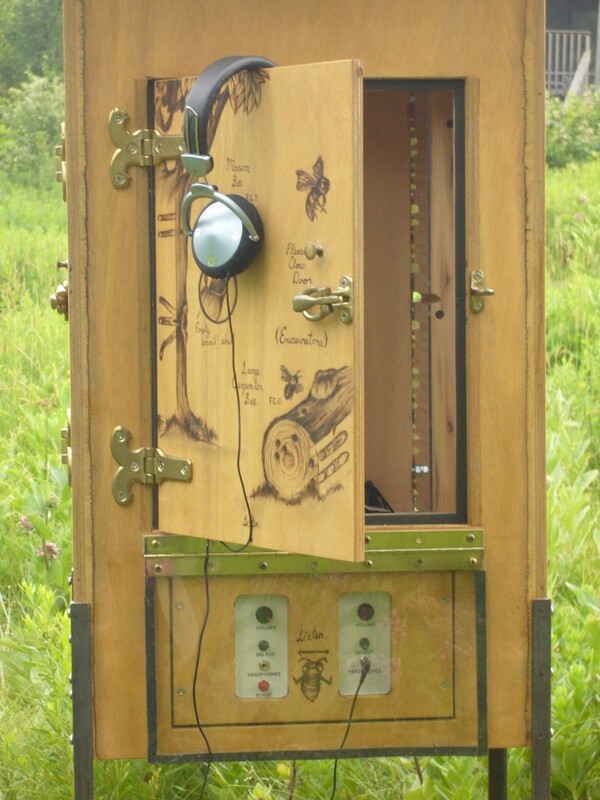 As this was a show devoted to audio installations temporarily installed, this work is now used by the Toronto Region Conservation Authority in field education. 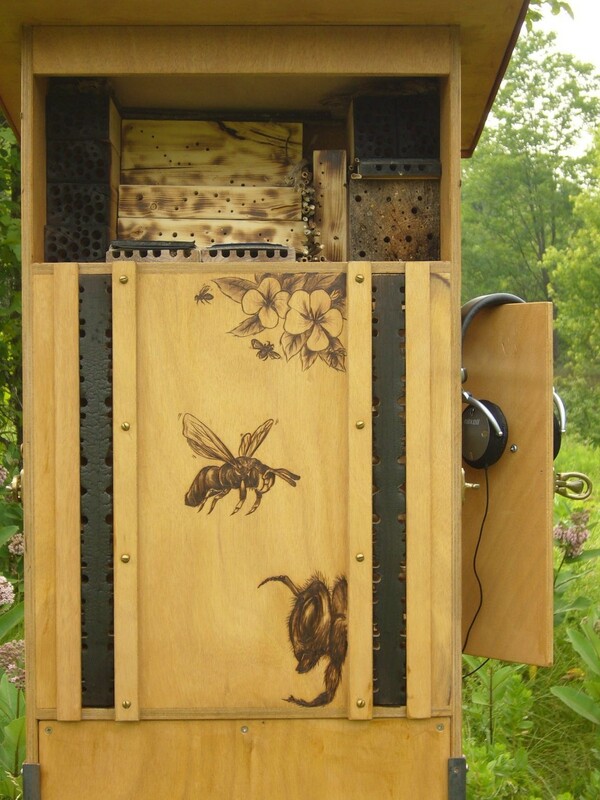 See the main page for other “Audio Bee Booth” works in this series which are open to the public, and for a video of this work’s premier while at the Tree Museum. Because of fluctuating conditions, it is probably not optimal for a plant to evolve too tight a relationship with any one pollinator. They must hedge their bets and maintain an hierarchy of pollinators. Some apparent inefficiency in the system at any one time may thus be necessary to long-term optimality. The booth contains magnifying lense, headphones and a booklet of Nest Notes which clarifies the woodburned illustrations on its surfaces (fig. 1, fig. 2, etc). Full viewing notes here. This is a wunderkammer (‘cabinet of curiosities’), full of curious living things. This is not a beehive. It has no honey bees, no honey, no colonies, no beeswax or honeycombs. 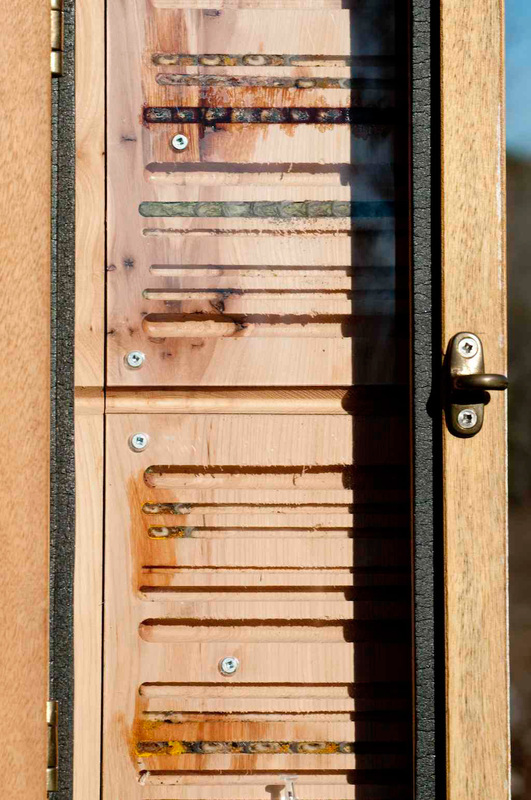 Like a condo, it has individual apartments for the many varieties of solitary bees and wasps native to Ontario. These single mothers live on their own and make series of individual brood cells, usually in old beetle bores in wood, or pithy stems such as raspberry bramble. 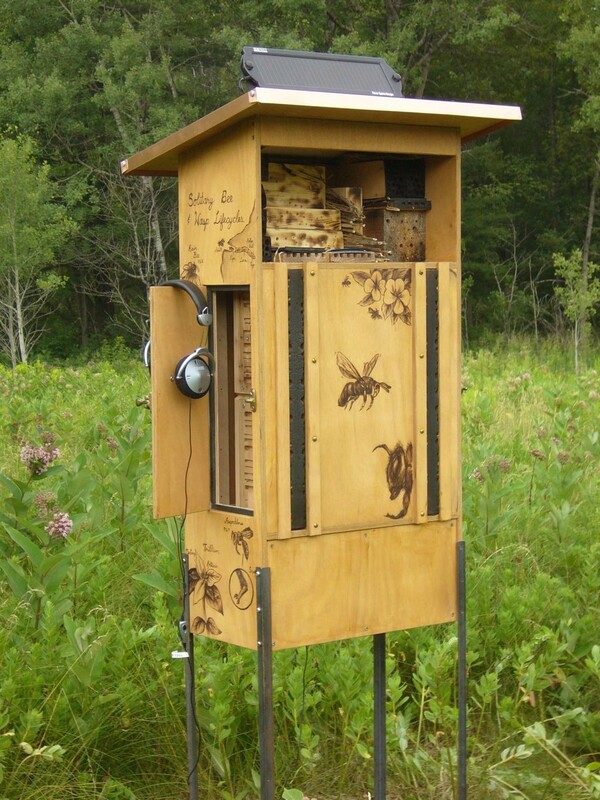 The cabinet is passive in that – like a dead or dying tree – it naturally attracts local bees and wasps already foraging for food, mating and hunting for homes in the field and surrounding woods. The station allows us to spy on their nesting activities, their fights with fabulously beautiful cleptoparasites (cuckoo bees and wasps) and sometimes with each other—activity normally inaccessible yet omnipresent in most rural and urban environments. All of which takes normally place in the dark. Sarah Peebles views Fall pupa in the booth. Use headphones (or earbuds) and a magnifying lens, get up close. You might see how the inhabitants vary greatly in size, form, colour and habits; the variety of materials they construct their brood cells from; which kinds of pollen (bees) or insects (wasps) they provision their eggs with; how their young develop. Don’t worry, they won’t sting unless accidentally trapped in clothing. They don’t care about you or me (or our food), though they might be shy. The enemies of solitaries are other insects, birds, and fungi. They lead simpler lives than their social cousins the bumblebees (who nest in underground cavities), European honeybees (mostly managed in hives) or paperwasps and yellowjackets. They do not defend their nest sites, like the social insects, whose colonies get raided by mammals such as raccoons, bears, or humans. Of the variety of earth’s pollinators, bees are responsible for the majority of “pollination services” to flowering plants; solitary wasps (from whom bees evolved) pollinate less, but provide essential insect control. There are likely more than 200 species of bees native to these fields and woods. The close synergistic relationship between plants and pollinators suggests that bee biodiversity—and by extension, plant and ecosystem biodiversity—is central to food security and to the health of the biosphere as a whole. 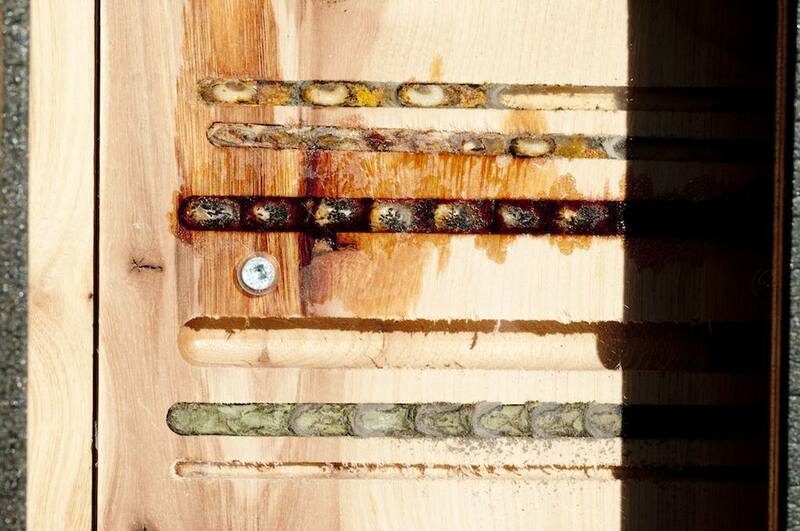 Fall pupa of 3 different bee species (a type of mason bee, a resin-using leafcutter, and another type of leafcutter ) See more at Inhabitants. Viewing Notes: Please be gentle with this cabinet. Open side doors and back door to view, being mindful not to expose the inhabitants to too much sun. 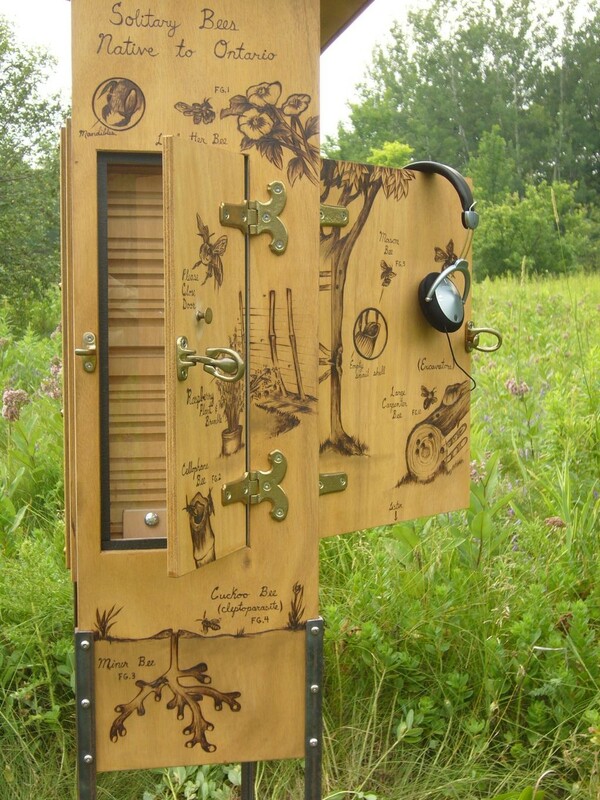 Headphones, magnifying lens and a booklet of Nest Notes are stored inside the cabinet, through the back door. Press ‘start’ to listen. Right and left nesting planks each contain an upper and lower microphone. The “select” switch chooses between the upper and lower microphones within each plank. Adjust volume control for comfortable listening, starting with the volume control at the minimum setting. Volume may vary greatly depending on insect activity. Power will shut off automatically in 10 minutes. 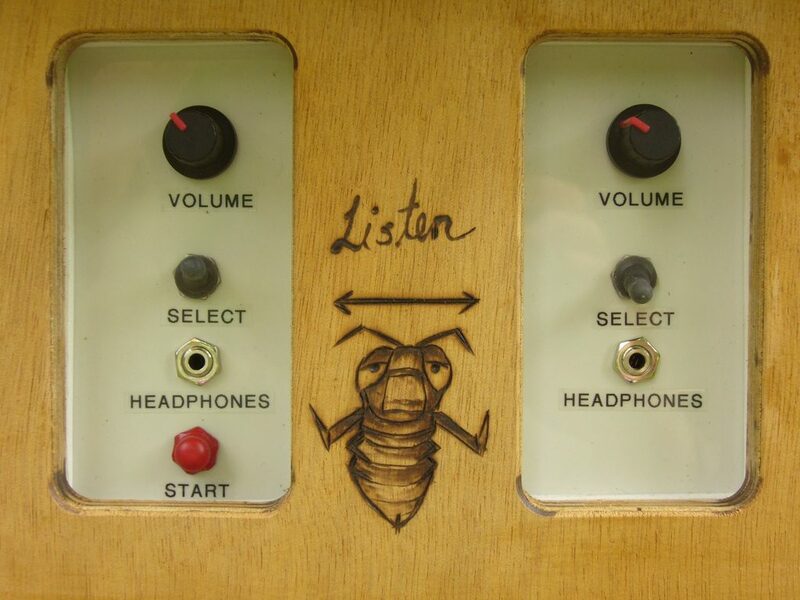 Assisted by: Rob Cruickshank (electronics), John Kuisma (woodworking) and Chris Bennett (wood burned illustrations). Consultation: Laurence Packer (York University), Peter Kevan (University of Guelph / CANPOLIN), Peter Hallett (University of Toronto / ROM), James Thomson (University of Toronto) and Stephen L. Buchmann (University of Arizona / NAPCC). Sarah Peebles is a Toronto-based sound and installation artist, improvisor and composer. 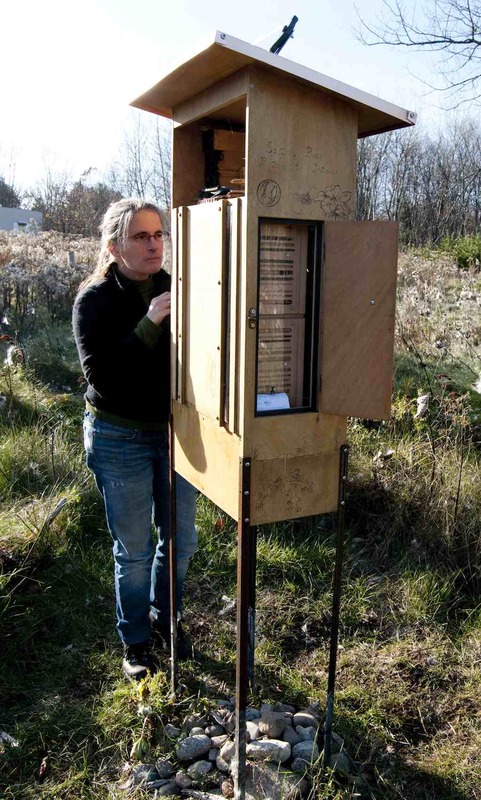 Her Resonating Bodies projects with collaborating biologists and artists focus on biodiversity of wild bees, ecosystems and co-evolution.